Ditch reading text. Make video–fast! The Halo makes video creation fun and easy! Unlike a standard teleprompter, where you read scrolling text, the Halo allows you to focus on your body language, hand gestures, and facial expressions while you create fast videos. No longer will you be distracted and slowed down by scrolling text, tedious rehearsing, and reliance on clunky teleprompter software. Simple – Record through the mirror, watching body language & facial expressions. Easy Setup – No assembly required. 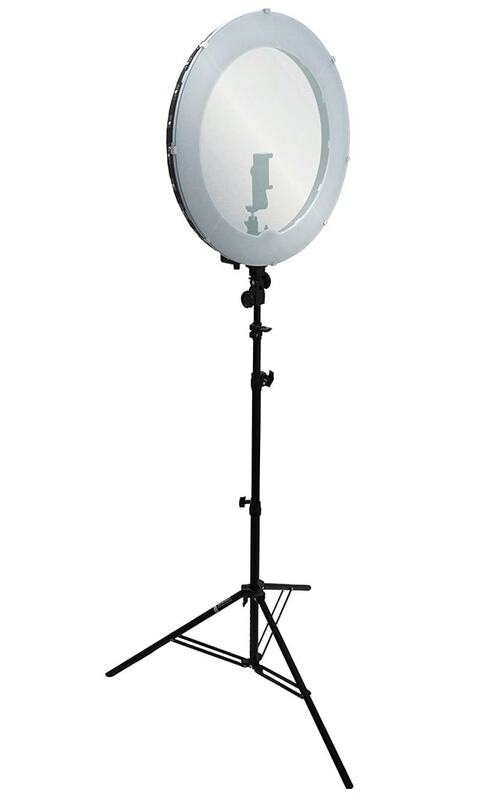 Optical Quality – 18″ Diameter Optical Grade Beamsplitter Mirror. Compatibility – Use a cell phone, DSLR, or camcorder to record thru it. No Software Required – Ditch the software, you won’t need it. Adjustable Height – The stand expands to a maximum height of 8 feet (2.4 meters). Adjustable Angle – Easily tweak the glass to the perfect angle for viewability. Ships Immediately – We keep the Halo in stock and ready to go. Guaranteed Quality – Hate it? Send it back to us! See the Halo in action! Modeling photo shoots and makeup tutorials are the forte of the Halo Teleprompter. Our teleprompter twins are back at it in this special production! James shows the recording quality of the included beamsplitter glass. Make awesome makeup tutorials with the Halo. See how assembling the Halo is a piece of cake. Check out what the Halo Teleprompter looks like in action! Check out our Presidential Teleprompter, which excludes the camera mounted tripod.